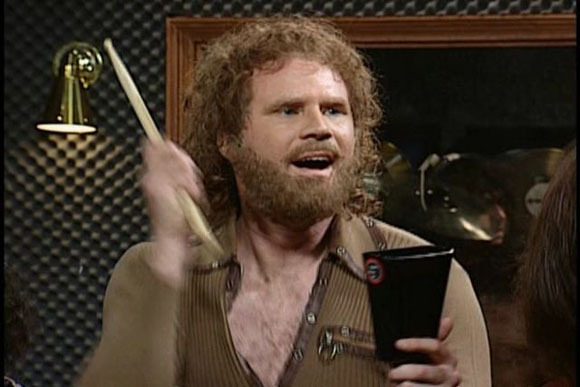 Ah, the cowbell skit / Behind the Music: Blue Oyster Cult parody from Saturday Night Live. (see also text transcript) Like other viral Internet phenomena (see also: All Your Base Are Belong to Us), it’s funny and it spread. If you’ve had your head in a hole since the year 2000 (that’s where I keep my head), now’s the chance to catch up: watch the video, and witness Wired’s 5 year history of the cowbell skit’s spread through the Web. “More cowbell” is a phrase now? I can’t keep up with these kids today. Digitally Modeled Cowbell: Hardware with the power of onboard DSP. Covered this parody in February, but the site is back up, and now you can buy a t-shirt. Perfect for showing up at the CDM party, should I, uh, ever hold one. Of course, we know the real place this phrase is now ubiquitous is in software presets, as in Digital Performer 4.6. Updated: Missed this entirely; everyone has cowbell on the brain. See Music Thing on reader tracks inspired by cowbell. Linked from the comments of that story: this has got to be the best ‘cowbell remix’ track I’ve heard, from none other than Derek Sajbel aka Absurdity.biz, maker of a fine documentary on circuit bending. Gotta have more Sajbel. What’s your favorite software cowbell: Is it Native Instruments’ Kowbel instrument? Logic Pro’s CWB 24L-X? Cakewalk’s infamous Magnacowbell Professional Producer Edition SE III? Hit comments or contact me and let me know.